The Secret Presentation (Grades 2-6, 60 min. ): Exploring secret codes, messages, and languages for historical communication and future fun. The Writer’s Journey (Grades K-6, 45-60 min. ): My path from wayward student to professional writer. Storybuilding (Grades K-6, 60 min. ): A hands-on guided writing workshop leading students from idea prompts to creative stories. What’s So Funny: Learn why people think something is funny, along with the different humor techniques that you can use to ease tension, convey character, move a story along and make your readers laugh (in a good way). Show Business: A hands-on writing workshop teaching writers how to avoid telling, and convey richer characters, settings, and themes with compelling details. 10 Revision Tips from Pros: The top tools shared from a variety of industry professionals on what works in revision, what doesn’t, and how a writer can make the changes they need for the most polished manuscript. Talking About Dialogue: A look at the fundamentals and more nuanced elements of dialogue that writers can use to create rich, dynamic manuscripts. I’m happy to tailor presentations for specific audiences and topics. My workshops include lots of visuals, exercises, humor, and useful information. 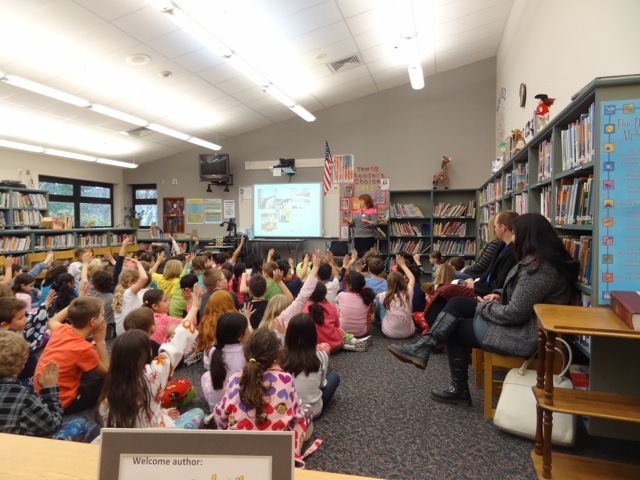 I’m also available for virtual Skype Q&A visits with your school, library, classroom, or book club. To inquire about current rates and availability, contact me here.